The SP from Budgam had submitted a report along with testimonies of seven witnesses, confirming that Farooq Ahmad Dar had been used as a "human shield" by the Army, said M Ahsan Untoo. 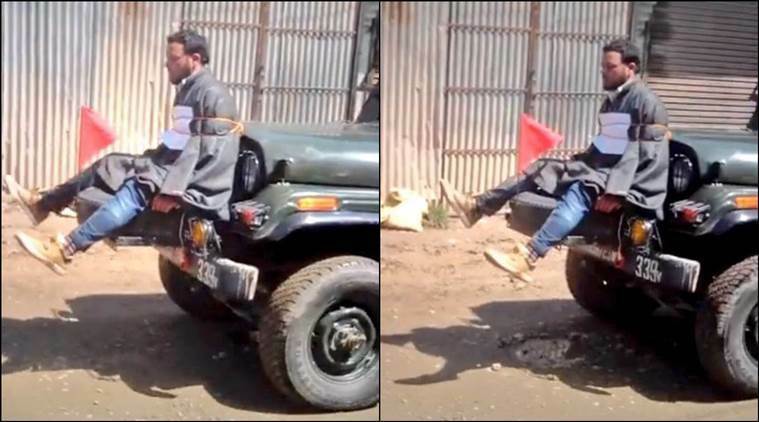 The Jammu and Kashmir State Human Rights Commission (SHRC) will hear a petition next month relating to a man who was tied to an Army vehicle and paraded around villages in the Budgam district of central Kashmir. The International Forum for Justice and Human Rights Jammu and Kashmir (IFJHRJK) has filed a petition in the SHRC against the April 9 incident, which is scheduled to be heard on June 5, IFJHRJK chairman M Ahsan Untoo told PTI in Srinagar. “We filed a petition on April 17 which was admitted by the SHRC and it subsequently served a notice to the Senior Superintendent of Police, Budgam,” he said. The police officer had submitted a detailed report along with testimonies of seven witnesses on April 27, confirming that Farooq Ahmad Dar had been used as a “human shield” by the Army, Untoo said. Dar had undergone a medical checkup at the Government Psychiatric Diseases Hospital in Srinagar and the doctors confirmed that he had developed “psychological problems” following the incident, Untoo said. “SHRC has set June 5 as the date for hearing of the case,” he added. Following fresh developments in the case, he said two more petitions were filed by the group with the SHRC on Wednesday pertaining to the statement of Major Leetul Gogoi of 53 Rashtriya Rifles, who was recently commended by the Army, and three national news channels for “deliberately defaming” Dar. “We are expecting the two petitions to be clubbed with the original petition and taken up for hearing on June 5 as well,” Untoo said. He questioned the statement of the Army officer defending his action a day after he was honoured. “The case is sub judice and the statement of the Army officer violates rules,” he said. Three electronic media outlets had prefixed the phrase “stone pelter” to Dar’s name, which was a “deliberate attempt to defame his image and support the statement of the perpetrator of the crime, who claimed that Dar was the ringleader of stone-pelting protesters”, he said. The Major allegedly trussed up Dar and tied him to the bonnet of a jeep on the day of bypolls to the Srinagar Parliamentary constituency, apparently in a bid to deter stone pelters.